A few minutes drive from where I live the Brunswick River joins the sea at Brunswick Heads, and throughout summer and autumn I like to swim everyday in the river, at high tide if possible. Sometimes in spring and early summer it’s cold getting in, so I have a little ritual that I do. 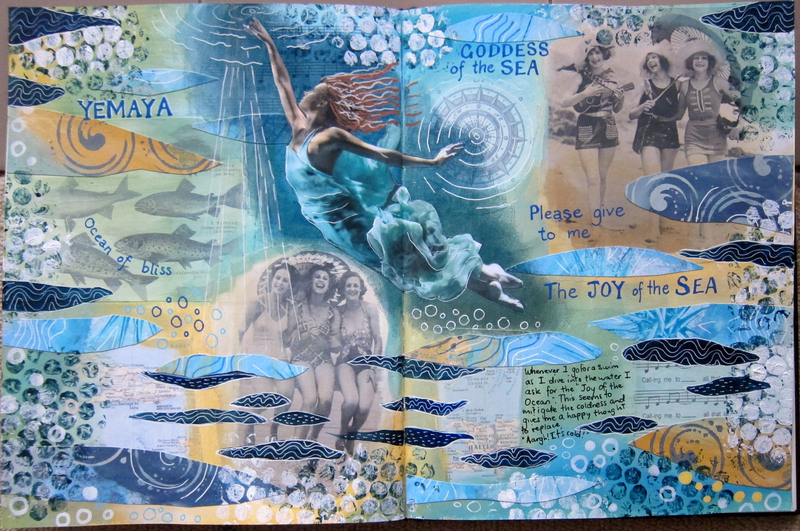 As I dive in I ask for the “Joy of the Ocean” to be mine, and I imagine the joy that all the sea creatures, especially dolphins and fish must have as they glide and leap about in the sea, and that I am receiving all that joy into my body. Somehow this stops me feeling so cold. Slightly. I imagine that I am asking this of the Goddess of the Sea. Anyway, this spread turned out to be about that. 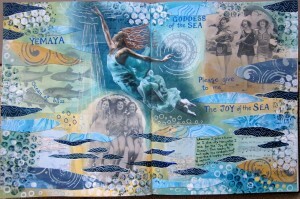 I’ve bought several 21 Secrets online art journaling courses now. As I think I’ve mentioned, some of the classes are inspiring and others not so much. I bought the Spring 2015 class largely because Roxanne Coble was one of the teachers. I made this page after I watched her videos. I know it’s not really very like her work, but well, my own thing started happening, so I just went with it. I decorated a separate page of watercolour paper with stencils and paint and gel pens, using the same colour scheme as my spread, and cut this paper up to use as collage. Roxanne was working in an old altered book which had some black and white photos in it. 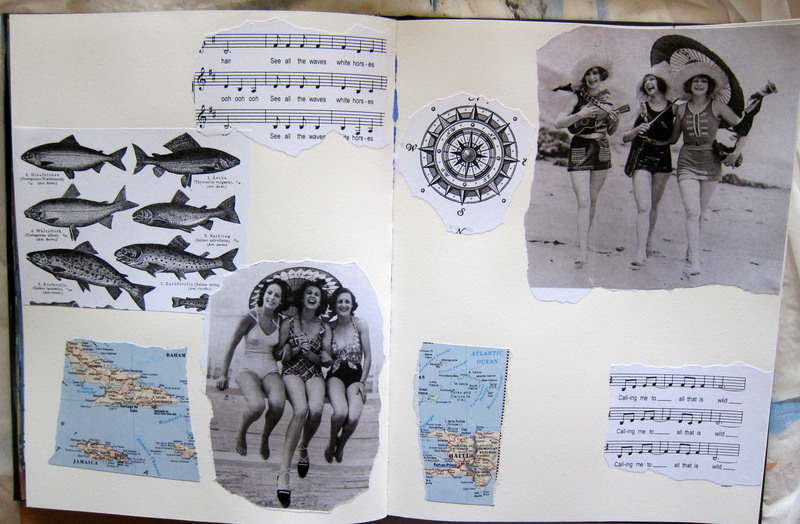 As I was just working on a blank page in my Strathmore art journal and not an altered book, I collaged down some old photos and other images before I started painting. I was loving my colour scheme, and even though i tried really hard to paint in some black areas , as Roxanne is fond of doing, I just couldn’t bring myself to do it in the end. That dark Prussian blue was the darkest i wanted to use. I sponged an area of Prussian blue on which to glue my focal image of the underwater ballet dancer, so that she would stand out against the background. 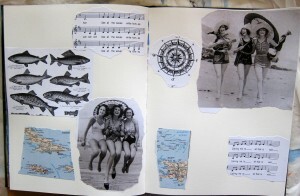 Here is the collaged page before I started adding paint: thank you for visiting my blog.